Do you enjoy the taste of Pepto Bismol? I always have. 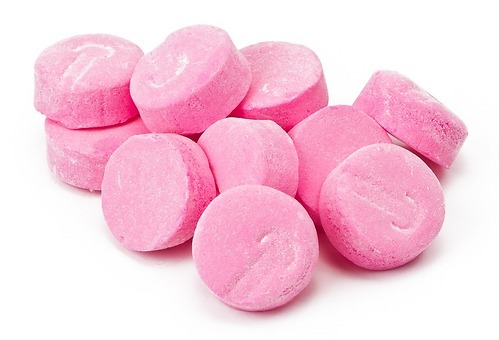 So much, in fact, that I eat those pink candies that taste just like it. Well, definitely not the best thing I've ever tasted. But not exactly the worst, either. I don't really like the taste, but when I need pepto, it tastes amazing good. Pretty sure its a conditioned response. do they taste like conversation hearts too? Are those the little heart candy with savings on them? If so, they do not taste like them. The normal stuff is okay. I bought extra strength Pepto once and it was unbelievably awful. what's the difference between the taste of pepto bismol and the liquid amoxicillin stuff i used to have when i was a kid? Well, whenever I took penicillin as a kid, before finding out I was allergic, it was usually more fruity. Sometimes it was a citrus, sometimes strawberry. Pepto is wintergreen flavored. But kind of a bland wintergreen. I'm gonna go with meh. So, I guess no. Though I can tolerate it? Let's put it this way: for medicine, it tastes good. Unlike stuff like Robitussin, Cheracol, etc. I can't keep any in the house because my husband will drink it when he doesn't need it. Why on earth would he do that? It doesn't taste THAT good. The chalky taste isn't too appealing. i have been told it's the best tasting medication. the person who told me this wasn't wrong. most other stuff like theraflu or whatever taste downright awful. i'm not some expert in medicine or anything, but i guess some sacrifices have to be made if you want to feel better. When you're pukey and acid-y, its not exactly the best taste in the world. The taste of it makes me feel sick, so drinking it just adds to my problems. Tastes better than the puke. I used to, but now it just reminds me of pepto puke.